Wouldn't it be a great idea to perform the classic Passe-Passe Bottles with potato chip cans? Now you can thanks to George Iglesias' Comedy Potato Chips. It's the perfect solution for a family-friendly Passe-Passe routine. On the table your audience will see two yellow tubes, a Pringles tube and a can of soda or juice (You choose your favorite brand). When you cover both items with the tubes, and wave your hand over them, they magically change places! Of course you can repeat the double transposition as many times as you want. It'll always work! Then, you tell a story about how once, in the middle of your show, someone swiped the Pringles can from the tube, (or if you work with a partner, he or she can "secretly" steal it). Either way, you can make a magic gesture and the Pringles can will reappear inside of the yellow tube. Put is aside one more time and repeat the whole process, magically the red Pringles can keeps coming back. At the end of the routine, you can show both yellow tubes to be empty. Best part? You can even open the Pringles can and tube take some chips out and then open the soda can and take a sip "proving" they are real. You supply one real Pringles Can and two soda or juice cans. In the Instructional DVD, George Iglesias will guide you step by step in the performance of the routines and preparation so you can easily perform this updated classic for your young audiences. At AmazeKids, we like this because it's a family-friendly version of the old trick, updated with contemporary food containers that will be familiar to your young audiences. 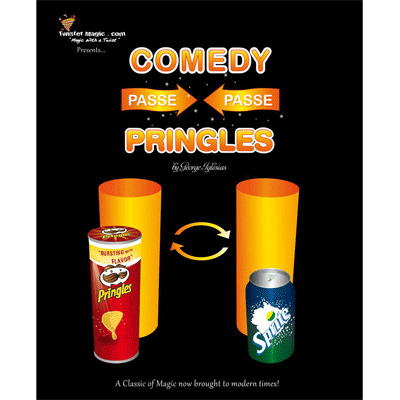 If you're looking for a great comedic routine in which the magic happens to you as well as by your audience, this modern day, kid-friendly Passe-Passe fits the bill. It's a great bit for birthday party shows, stage performers including emcees. Add a little "crunch" to your show with the Comedy Potato Chips!